Target category No. 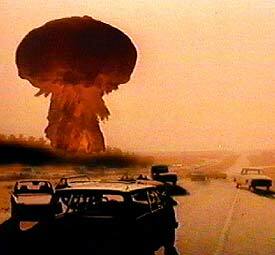 275 from the nuclear target list for 1959 may be the most chilling. It is called simply “Population.”. For the first time, the National Archives and Records Administration has released a detailed list of the United States’ potential targets for atomic bombers in the event of war with the Soviet Union, showing the number and the variety of targets on its territory, as well as in Eastern Europe and China. The 800-page document, marked “Top Secret” and in a fuzzy gray typescript, comes to light as the issue of air power and the possible targeting of civilians is again in the news. The United States has avoided bombing the Islamic State’s headquarters in Raqqa, Syria, for instance, because of the presence of civilian prisoners in the same complex. “The object is to kill the ISIS terrorists,” he added, using an acronym for the Islamic State. The newly declassified target list is titled “Atomic Weapons Requirements Study for 1959.” It is essentially a huge spreadsheet, produced by the Strategic Air Command in 1956 and projecting what could and should be hit in a potential war three years later. It was produced at a time before intercontinental or submarine-launched missiles, when piloted bombers were essentially the only means of delivering nuclear weapons. The United States then had a huge advantage over the Soviet Union, with a nuclear arsenal about 10 times as big, said Matthew G. McKinzie, the director of the nuclear program at the Natural Resources Defense Council. Alex Wellerstein, a historian of nuclear weapons at the Stevens Institute of Technology in Hoboken, said that in 1959, the United States had atomic bombs totaling about 20,000 megatons. President Dwight D. Eisenhower pushed to reduce the arsenal, and the tonnage was cut by half over the next year or two, he said. “He just thought this would lead to the annihilation of the human species,” Mr. Wellerstein said. At the time, military planners sought to surround the Soviet Union with bomber bases and, in the event of war, called for what they referred to in official documents as a “bomb as you go” strategy, flying toward the biggest Soviet cities and hitting every listed target along the way, Mr. Wellerstein said. The 1956 document makes air power the highest-priority target, including 1,100 Soviet-bloc airfields, since the goal was to destroy Soviet bombers before they could take off and head for targets in Europe and beyond. But many air bases and command centers were in and around population centers, so even those strikes would have resulted in extensive civilian casualties. The targets with the second-highest priority were those of the industrial infrastructure. That included the people who ran it. Several military historians said Tuesday that while the general principle that civilians should not be targeted dated to before World War I, actual practice had often been dictated by the military needs of the moment. The allies in World War II and the Korean War began with a principle of avoiding killing civilians to the extent possible. But in each conflict, that ideal often gave way to bombing cities because it was seen as a military necessity. Targeting civilians has often been viewed as a way of undermining enemy morale, prompting a revolt or surrender — and conceivably leading to a shorter war. And so the large-scale bombing of civilians has sometimes been defended on humanitarian grounds, even after the firebombings of Tokyo and Dresden, Germany, and the atomic bombs dropped over Hiroshima and Nagasaki. The authors of the 1956 target list had lived through those experiences. But with two superpowers facing the prospect of nuclear annihilation for the first time, the assumption was that one side or the other would quickly prevail, with deaths in the millions. Stephen I. Schwartz, an independent consultant on nuclear weapons policy and the co-author and editor of a 1998 book on American nuclear weapons, “Atomic Audit,” called the target list “grim and frankly appalling.” But he said he was pleased that the document had been published at a time when fewer and fewer Americans, including policy makers, have much knowledge of nuclear weapons.